Geneva is by no means a cheap destination, but like all destinations, there are many free and inexpensive things to do. With these tips, your wallet will be able to reemerge relatively unscathed. Geneva is a city where a kebab from a questionable-looking stand can be relatively expensive, and finding an affordable sit-down meal in the central city is certainly a challenge. Take the number 12 tram from the center of Geneva to the end of the line and then walk across the border into the French town of Gaillard. Here you will find restaurants that are much cheaper than in Geneva. Generally, the university area of Plainpalais is a good bet for food on the less painful end of extortionate. La Buvette des Bains; Quai du Mont-Blanc 30; Probably the best deal in town. Office workers in the know flock to this eatery on the jetty by the lake for its daily lunch specials. Chez ma Cousine Lissignol; Rue Lissignol 5; This place does one thing and it does it right: chicken and fries. The outdoor terrace is a great place to watch the people go by in this Old Town establishment. Carosello; Boulevard Georges-Favon 25; Enjoy good pizzas and the daily special (pizza with salad). Manora, Rue de Cornavin 6; A self-service cafeteria on the top floor of department store Manor, it serves a wide choice of food and provides a panoramic view of the city. Boky-FuShun, Rue des Alpes 21; Some praise its extensive Chinese menu, some say it's gross, but one thing's indisputable: It's hard to find a cheaper dinner in the city center than here. Parfums de Beyrouth, Rue de Berne 18; Considered a hole-in-the-wall kind of place, but any of its assiette plates are more than enough to feed two people and are pretty tasty. Leave your rental car behind. Geneva's notorious riverside traffic means you're better off without a car. Besides, it's doesn't cost a nickel to travel in and around Geneva. You can actually get around free in Geneva. 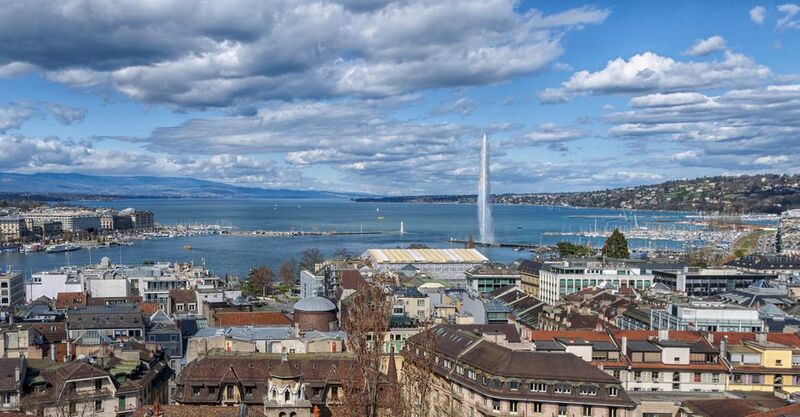 Every person staying in a hotel, hostel, or camping place in Geneva is entitled to a handy little ​Geneva Transport Card, which gives them unlimited travel around the city and near suburbs for the entire duration of their stay. Ask for it at your hotel or hostel, and make sure you carry a passport with the card. Before you leave the baggage claim area, look out for a machine that says "free ticket," right by the exit. This is no scam. Just press the button, and you'll get a ticket valid for the next 80 minutes on trains, buses and trams, completely free—enough to get you to your hotel. Renting a bike can cost you money, but there is a free alternative. ​Geneve Roule provides free bikes during the summer months for four hours at a time. Throughout Geneva, there's free Wi-Fi, which is great news for those who are addicted to their phones. Look out for a network called "((o)) ville-geneve." The coverage is spotty, but it's totally free. There are plenty of hotspots scattered throughout the city. The public library, with strong, free wireless signals, is located inside the Parc des Bastions. The reading room (​​salle de lecture) has workspace and electric plugs for your notebook. There's also free Wi-Fi at the Geneva Airport, but you need a mobile phone. Get online first, and then follow the instructions to enter your phone number. A free access code will be sent to you as an SMS. Getting online is completely free, but some mobile carriers will charge you for receiving text messages abroad. Many hotels, restaurants, and cafes around Geneva also advertise free Wi-Fi, but some require an existing account with an internet provider. So make sure the establishment has its own free Wi-Fi network before you plonk down and order that coffee. De la Rive and de Saussure, you've seen their names on the streets. Now find out their significance as scientists at this museum of astronomy, geology, meteorology, and other disciplines. Check out the variety of dioramas and other specimens. Take a look at rare 18th-century manuscripts that are housed inside the public library. Dedicated to the art of ceramic, the extensive museum presents more than 25,000 pieces on display. Go outside and explore Geneva's stunning nature—gratis, of course. For the less aquatically minded, there are also public shuttle boats, which are free with your Geneva transport card. Parc des Bastions: Play chess on a life-size board or listen to students strumming their guitars; in Plainpalais/University. Parc des Cropettes: Stretching from right behind the train station, the park features pond; in Quartier Les Grottes. Parc Beaulieu: Right across the street from Parc des Cropettes, this spot is especially great for kids; in Quartier Les Grottes. Jardin Anglais: It's a popular hangout with the famous flower clock; right on the lake. Parc des Eaux-Vives: This has a hilly park with gorgeous patches, along with its own beach and boat dock; in Eaux Vives. Free cinema under the stars: From the thousands of titles nominated by Geneva residents, a collection of films are selected and shown in parks from July to August. Some newer films charge entry fees. Free concerts in the sun: In public parks around the city, musicians from around the world give ​free concerts from July through August. Marché de Plainpalais: One man's trash can be your treasure. You can find lots of old Swiss stuff here. Plaine de Plainpalais. Boulevard Helvétique: Check out the outdoor farmers market for your Swiss produce pleasures. Place de la Madeleine: Purchase clothing and books here.